that one is leaning dangerously. The last two weeks have been among the toughest of the 20 years I’ve been an arborist. The combination of the hurricane, the snowstorm and the broad and long-lasting power outages is unlike anything I’ve encountered before. All of us at Almstead have had too many opportunities to witness the violence of nature, as we’ve removed hundreds of trees that have damaged houses, cars and other property. Although Sandy has passed, the damage is ongoing. We’re still receiving calls from people who have trees or branches falling, or threatening to fall, from the damage caused by the storm. This is a good time to take a walk around your property, looking up. Many trees have cracked branches that need attention: some need to be removed before they fail, while others with minor stress cracks can be saved by cabling. It’s also important to check that any previously installed cables are still in place. Follow-up pruning may be needed for branches that snapped or were improperly pruned by an emergency service. When pruned correctly, trees usually create a natural barrier against decay; improper pruning leaves a wound that is much more likely to lead to further problems. You should also look for any trees that have shifted root plates or other signs of movement. 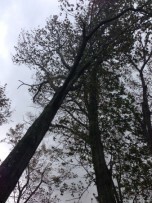 As we work to clean up the damage caused by Hurricane Sandy, we’ve noticed that many of the fallen trees and branches had defects that probably would have been identified by a qualified arborist. So don’t panic and start removing all the trees from your property; while it’s true that no tree is guaranteed against the violence of a hurricane, healthy, well-pruned trees have amazing resilience. The trees on your property have shown they can survive a hurricane! With a little attention, they will probably continue to provide beauty and shade for another generation or more. Arborists are trained to identify tree problems before they occur, which is just one reason to have a certified arborist inspect your trees. This is a good time to contact an arborist to inspect your trees for any potential problems.